Thanks very much for speaking to Boomerang Books blog, Clare. Your two YA novels Nona and Me and Between Us are memorable, thought-provoking and ‘uncomfortable’ in the best way. I learn and am changed by them. Thank you! I don’t think I could ask for any better feedback than that as an author. I’m based in Darwin. There are a few YA writers up here who I see at events and workshops. I also travel to Sydney fairly regularly, mostly for TV scriptwriting work. There’s a YA author meet-up there, which I attend when I can. I’ve also met lots of YA writers through speaking at writing festivals. I can’t speak highly enough of the supportive, fun and vibrant community – YA authors are the best! How has your television scriptwriting enhanced your novel writing? TV writing has taught me a lot about structure, flow, characterisation and weaving multiple story strands together. I wrote both my novels as a kind of hybrid, in which each segment or chapter is really a scene that needs to move the action forward. And I am very comfortable writing dialogue – my books probably have slightly more than average. Your first novel, Nona & Me (Black Inc), achieved critical acclaim. I reviewed it for the Weekend Australian here. How were you able to describe this Aboriginal experience in the Northern Territory with such authority? I don’t know about authority but I definitely did thorough research and consultation over a couple of years. I was also living in Yirrkala, the community in the novel, at the time. I interviewed many community members, both in the mining town and Aboriginal community, and worked closed with a wonderful Yolngu cultural advisor and teacher called Merrkiyawuy Ganambarr-Stubbs. Without her advice and feedback I don’t think I could’ve written the novel. To what does your title, Between Us (Black Inc), refer? Which came first, your title, the story or something else? I am interested in the spaces between people and how, in the absence of knowledge, fear or love can fill the void. I liked that the title had a number of interpretations. Between who – Ana and Jono? Or Jono and Kenny? Or Kenny and Ana? And is what is ‘between us’ holding us together or pushing us apart? 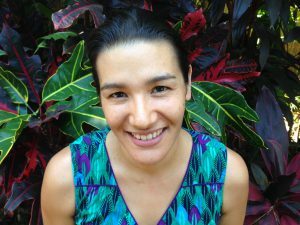 The characters came first – I wanted to explore characters representing different eras of immigration in Australia and was excited about having a character – Jono – with my own cultural background. 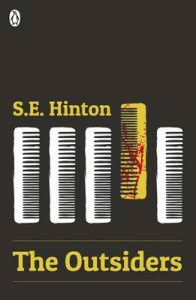 The cover is based on some photos I took in Darwin during the wet season. The moody skies up here during storms are breathtaking, both beautiful and ominous at the same time, as I hoped the novel would be too. 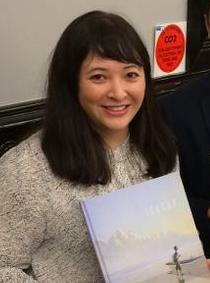 I sent the photos to the publisher who forwarded them to the cover designer. I liked the phone lines as a visual reference to both connection and distance; one of the ways Jono and Ana are able to connect is on the phone. 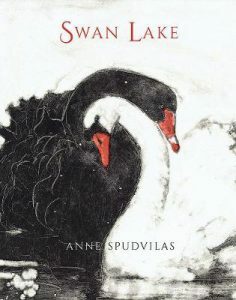 And birds are a repeated motif in the novel – a symbol of freedom, a point of connection and a link to memories for Jono, Kenny and Ana. How does Between Us differ from Nona & Me? Are there any similarities? I think I’ve experimented a lot more in Between Us. I wanted to push myself as a writer. Nona & Me was my first novel and whilst I played with structure it was still in prose from a single point of view. 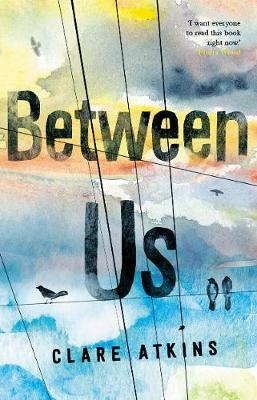 Between Us is from three different cultural perspectives and incorporates sections of verse. 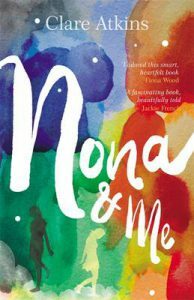 And whilst Nona & Me was a personal exploration of Indigenous politics, Between Us focuses more on immigration and multiculturalism. How were you able to access information about life inside a detention centre and then form it into fiction? Weaving real life stories into fiction is my favourite thing to do. It takes a lot of research – this time around three years worth. A lot of the interviews had to be ‘off the table’; people were happy to talk but didn’t want their name attached to the book in case it caused trouble for their jobs or visa applications. I have spent time inside Villawood as a volunteer helping to run activities for kids, and visited asylum seekers in Wickham Point. I also worked with an Iranian cultural advisor, Shokufeh Kavani. You’ve written from several different viewpoints in Between Us, even from an adult character’s perspective. Could you introduce us to your major characters? How have you differentiated between their voices? Ana is a fifteen year old Iranian asylum seeker who is only allowed out of detention to attend school. She desperately wants to be a ‘normal’ teenage girl, but her life inside is far from standard. Her mum is pregnant, her little brother is desperate to get out and run, and her mum’s boyfriend is stuck on Nauru. Ana’s voice is initially curious and passionate and determined. Kenny is Jono’s father. He was sponsored out to Australia by his older sister, Minh, who arrived with the first boatloads of Vietnamese refugees. Kenny has just started work as a guard at the detention centre where Ana lives. Kenny is confused by the various thoughts and feelings swirling around the issue of asylum seekers. His voice is informed by his Vietnamese culture and his insider’s perspective as both a guard and as Jono’s father. Which character would you like to write more about? I’d like to write more about Kenny. He’s such a multifaceted character who has access to so many different worlds. He’s Vietnamese but has now spent almost half his life in Australia. He’s a father but is still working out life himself. He’s the brother of a boat person who now guards asylum seekers. I love that he is complex and confused and flawed but very real. I was excited by your changing use of verse in the novel. Could you share what you’ve done? I wanted to use verse to convey emotional state. When you’re depressed it is hard to communicate or connect to the outer world in more than short bursts or impressions. It was a bit of an experiment – I’m excited that you liked it. You mention Australian hip-hop band The Hilltop Hoods. Why this band? I spoke to some Iranian young people who talked about Iranian rap and hip-hop and how political and dangerous it can be. I looked for an Australian equivalent as a point of connection for Jono and Ana. Hilltop Hoods takes me back to my early twenties so I suppose I had an existing affection for them. I liked that they are sometimes political but can also be playful – they have a freedom that Iranian hip-hop artists don’t have. In the novel you’ve referred to other literary texts such as The Outsiders, The Rabbits, The Simple Gift and Home in the Sky. Why these books? They are all books and authors I love and admire. 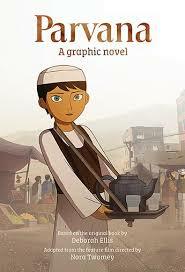 They also feed into the central themes of the novel about insiders and outsiders, culture and colonisation, connection and distance, freedom and belonging. 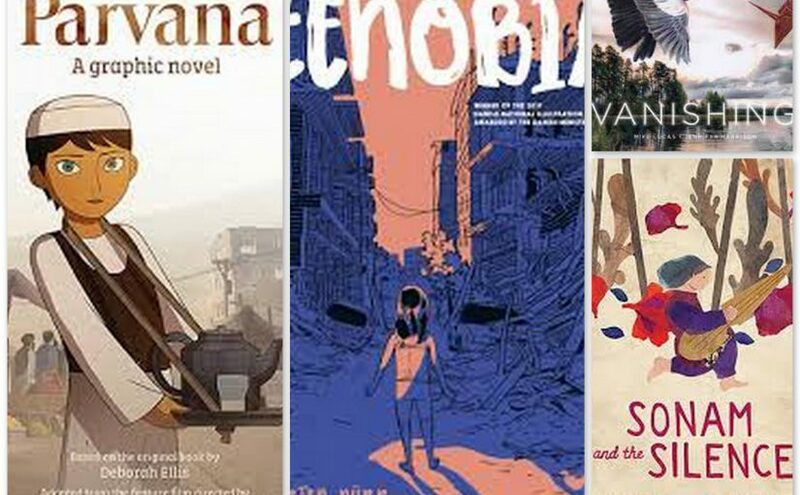 Why is the novel a powerful forum to alert people to the plight of refugees and those in detention centres? What would you encourage your readers to do next? 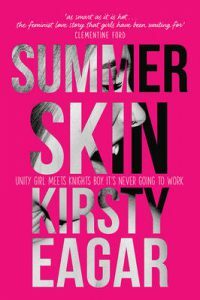 Books that I’ve enjoyed lately include Kirsty Eagar’s Summer Skin, a smart YA romance that looks at modern hook-up culture with a feminist slant, and The Good Girl of China Town, a bravely honest cross-cultural memoir about Jenevieve Chang’s experiences as a dancer in Shanghai’s first burlesque club. Thanks for your insightful answers, Clare. I’ve learned even more! All the best with Between Us. There are times in every small person’s life, when they are faced with taking the plunge, striding into the unknown, and just striking out into that adventure called life. It’s not always easy, sometimes it’s downright wrenching, but who says it can’t be fun. Here are a cluster of recently released picture books that will enlighten and inspire in those darker and daring times. 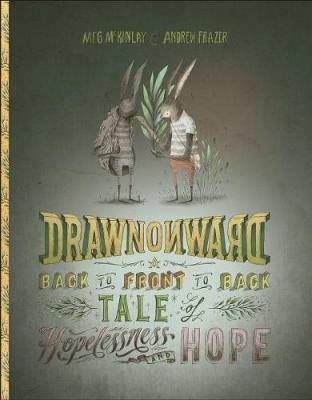 I adore the sinuous artistry of this incredible picture book team. 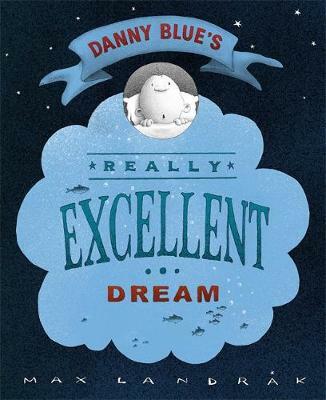 A picture book with their names on the cover promises great subtlety and infinite pleasure. Crusts is no exception. One third graphic, two thirds regular, this picture book grabs the most frustrating habit a maker-of-lunchbox-lunches has to contend with – the uneaten crust and flips it on its head. Jacob is your typical crust-eating refusal expert. His mum is your typical eat-your-crusts enforcer. Neither is willing to give any ground, which is unfortunate because in a galaxy far far away, a tiny planet is crumbling into nonexistence and has had to jettison three explorers to Earth in an attempt to locate and transport planet-saving crusts back to them. At first, it seems the mission is doomed to fail as Jacob squirrels away crusts by the bin load and scribbles away at plans the explorers feel are useless to their cause. Turns out, there is more to Jacob’s distaste in crumbs and ingenuity than meets the eye. Parker’s narrative is always spot on, poetic and soulful. Ottley’s fanciful illustrations strike the perfect balance between droll fantasy and tragic normality. 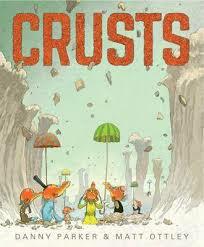 Crusts is a crowd pleaser even for those unwilling to swallow one physically. It accentuates the values of tenacity, humanity, selflessness, and kindness and comes highly recommended for lovers of invention and space travel. I love the plucky audacity and determination shown by Zelda the chook. Zelda has a dream, ‘to be the first chook in space.’ However, the road to the Milky Way is long and arduous and none of her coop-mates is willing to lift a primary wing feather to help her achieve her ambitions. Undaunted, she strikes out alone and finally launches herself into chook history. When she eventually comes home, her fickle-feathered friends agree Zelda’s tenacity and drive are by far the best examples of how to get anywhere interesting they’ve ever encountered. 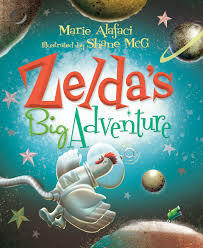 With her appetite for space exploration sated, Zelda concedes adventures are always more fun when shared with friends. 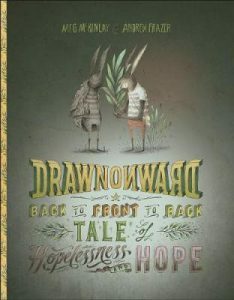 This is a fun, easy to read, easy to share picture book encouraging perseverance and courage. Great for pre-schoolers and early primary readers and chook lovers like me. Like his previous titles, The Story Machine and The Cloudspotter, Up, Up and Away warms the very cockles of your heart and is guaranteed to cheer you. Unlike Zelda who travelled far into space to find her first planet, Orson, a boy who loves to make things, prefers the challenge of making his own. And he does. At first, the new planet is slow to find its position in Orson’s universe but slowly with a lot of tending loving care from Orson, his planet grows up and even develops its own gravitational pull. That is when Orson realises, that he must let his beloved planet find its true place among the stars. Under five year olds will relate to this on a number of levels; pets growing up, butterflies dying, outgrown shoes and so on. Adults will be reminded that one day their own tiny planets will eventually have to orbit elsewhere, too. This whimsical picture book describes the sometimes unavoidable necessity of letting go of things you love the most in order to set them free. McLaughlin elevates this difficult life lesson to a place of beautiful reason and logic in spite of the nonsensical notion of mixing up a planet from scratch from ‘a cup full of rocks and a dash of water’. 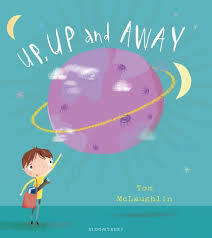 Powerful and smart, Up, Up and Away is about accepting and recognising challenges and change. Sometimes taking on new challenges is not always a matter of choice. 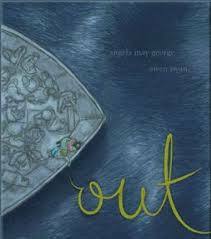 Out is a stunning debut picture book by George, which tackles the unrelenting struggles of refugees and their emigration attempts. We never learn the real name of the young asylum seeker in this story, but she is recognisable as a girl with much heart and soul and deep pools of courage. 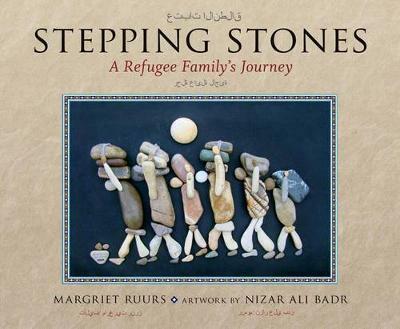 Together with her mother, they endure a treacherous journey from their homeland to Australia. Life is very different, and it takes a while for them to assimilate to the music, dancing, and language. Everything is a new challenge for she and her mother and yet throughout their ordeals, she always retains the thinnest, most fragile tendrils of hope, as depicted by a bright yellow ribbon she carries everywhere. Written with frank solemnity Out resonates with positivity and a belief that good will always prevail. Swan’s gentle muted illustrations convey emotion and compassion and allow the characters of the story to stand out when they are surrounded by so many others that are in exactly the same boat as they, as it were. Persuasive and compelling, Out will suit readers four and above and help them realise the strength of the human spirit whilst appreciating the various paths they can take (or must make at times) to reach their goals. I want to frame this picture book and hang it on my wall. To label Teacup as having bucket-loads of appeal for audiences familiar with and sympathetic to displacement, migration, social disruption and family change strips away the myriad of other sophisticated, elegant qualities this book deserves to be described by. It is simply sublime. 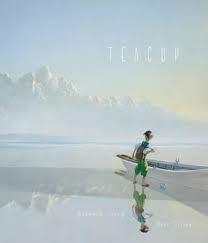 Teacup by Rebecca Young and Matt Ottley is a timeless story of a boy fleeing his home to ‘find another’. We know not where from nor why but immediately warm to his story after learning that amongst the meagre possessions he takes with him is a teacup which holds some earth from where he used to play. Unlike any other creature on earth, the need to retain ones past in order to make ones way better into the future is strongest in we mere humans, especially in times of dramatic change. Therefore, the boy sets off across seas sometimes kind and friendly, other times wild and testing. Along the way he has time to contemplate all that he has left behind; his home, his sense of place, his beloved family and the naivety of childhood. The clouds that swirl above him may not be permanent but his memories remain secure as does his hope, until one day that hope takes root in the form of a sapling apple tree. This symbolic tree of life sustains him until the day his is able to build his life anew; older, wiser, a better receptacle for change, just like his teacup. The beauty of this story is its incredible scope. It could be describing loss or the dislocation of refugees. Others will interpret it as a story of a search for love and belonging. Whatever journey Teacup takes you on, Young’s eloquent use of words and symbolic imagery massage your emotions to the point of quiet reverence. The narrative bobs gently upon these thematic eddies, always moving forward, into the unknown. Even more arresting than the text are Ottley’s illustrations. More like a collection of fine art, they are jaw-drop beautiful, each a breathtaking portrait of the boy’s journey. 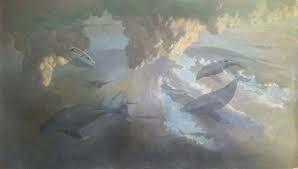 Dense in texture and meaning, Ottley’s illustrations reflect sky and sea, at once both soothing and uplifting. Teacup is a picture book to treasure for its undiluted beauty and the subtle way it transcends moralising on human rights and condition, thus making it an important and exquisite reading experience for youngsters aged four and above.